Remember lens covers are included to protect your equipment. 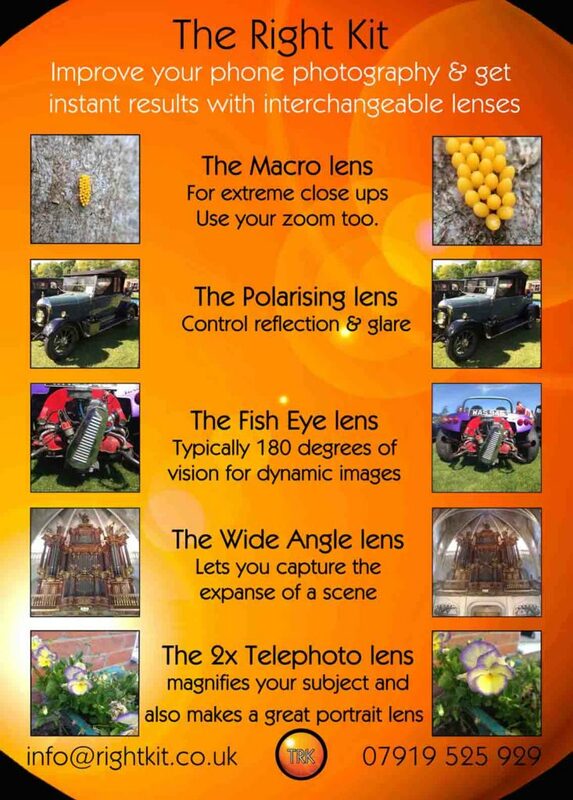 Fine tune your composition by using the focusing ring on the 8x & 12x telephoto lenses, use a tripod to give you stability and therefore a clearer image. For best results make sure the lens and lens clip you use covers your phone lens closely and fully to avoid light leaks. Results can be different if you remove your phone case when using The Right Kit. Clean the lens you want to use with a soft dry cloth, then screw it into the holder and position the lens centrally over your camera lens using the clip or the magnetic rings. To attach a magnetic ring, peel off the backing paper and stick the ring around the camera lens on your phone, make sure it lays flat without covering the lens or sensor. Position the lens centrally over the magnetic ring. The protective film can be removed from the ring. These lenses are suitable for most smart phones and tablets. Using lenses may block your flash or sensor. The lenses, caps, clips, backs & magnets are not toys. Neither are they edible, they are for photographic use only, please keep them away from small children. Most importantly, the full range of lenses essentials and accessories are available online. Call Sandra for aftercare & replacements parts. I am booked! The Events page will tell you where to fine me.